MTV, VH1 and other cable channels owned by Viacom Inc. used to be best known for music videos and behind-the-music shows. Now the company is introducing a new way to experience music on its sites and apps: without the visuals. Viacom's music group is forming a marketing partnership with Swedish streaming service Spotify AB to allow users to listen free to music by the featured artists on its websites, along with playlists related to its series and franchises such as MTV's "Teen Wolf," VH1's "Love and Hip Hop," CMT's "Party Down South" and the "MTV Video Music Awards." At least 150 Spotify playlists will be accessible free across Viacom's network of sites at any given time, the companies said. Spotify will also promote the playlists to its 40 million users world-wide—more than 10 million of which pay $10 a month for unlimited access to Spotify's 20 million-song catalog. For Viacom, the partnership is a way to bring its iconic music brands back to their musical roots. 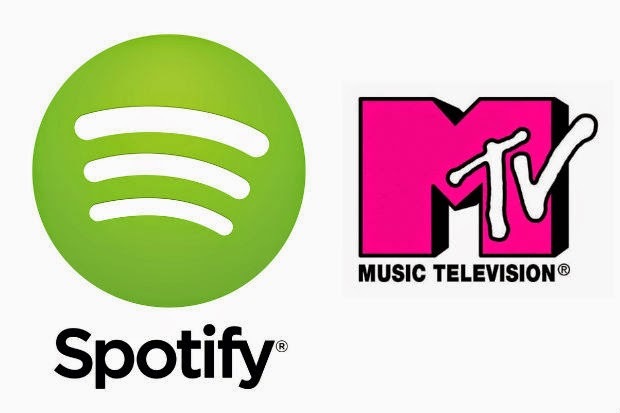 Spotify founder and chief executive Daniel Ek said that while MTV was paramount for music lovers when he was growing up in Stockholm—so much so that he credits MTV for helping teach him English—"the younger audience has a very different relationship to (Viacom's) properties, which have become more about reality shows." "We can bring back the music in MTV and bring its programming to a wider audience again," said Mr. Ek. MTV shook up the music world when it launched in the early 80s as a cable-TV channel that played music videos 24 hours a day. Viacom acquired MTV's parent company in 1985. But as the novelty wore off and younger viewers migrated online, Viacom replaced most of MTV's music-video programming with reality shows and scripted series such as "Skins" and "Awkward." The two biggest record companies, meanwhile, Vivendi, Universal Music Group and Sony Corp.'s, Sony Music Entertainment, launched their own digital music-video site in 2009—Vevo LLC—to bring in advertising revenue, something MTV didn't share with them in its heyday. Van Toffler, president and chief executive of Viacom's Music Group, said the company wanted to renew its reputation for providing "unfiltered access" to artists and bands without leaving Viacom's sites. For Spotify, the exposure on Viacom's music platforms—which clock 60 million unique monthly visits—could help it sell more subscriptions. The company is facing fresh pressure to grow after Apple Inc.agreed to buy Spotify's young competitor, Beats Music, this May. Spotify, which has been valued at $4 billion, isn't profitable, its executives say, because it has been investing in an aggressive international expansion. It has launched in 57 countries but has yet to crack key markets such as Russia, India, China, Canada or Japan, where consumers spend more on music than almost anywhere else. Mr. Toffler said he began discussing the partnership with Spotify well before Apple's Beats acquisition. Viacom still considers Apple a close partner—it sells content on Apple's iTunes Store and runs promotions with Beats headphones—but the company isn't discussing a partnership with the Beats Music streaming service at the moment, he added. Mr. Ek said that he was unfazed by Apple's acquisition of Beats. "Honestly it doesn't affect the game plan," said Mr. Ek, adding that he was focused on creating the best user experience possible. Though Spotify is now competing with similar streaming services run by giants such as Apple, Google Inc., and Amazon.com Inc.—all of which can push music subscriptions to their massive existing customer bases—Mr. Ek said there were plenty of examples of scrappy companies that were besting the behemoths in other sectors. Among them: note-taking app Evernote and cloud storage firm Dropbox. "The best product wins," he said.